The University of Maine football team’s slim NCAA Football Championship Subdivision playoff hopes were dashed by Saturday’s 31-17 loss to Delaware at Portland’s Fitzpatrick Stadium. 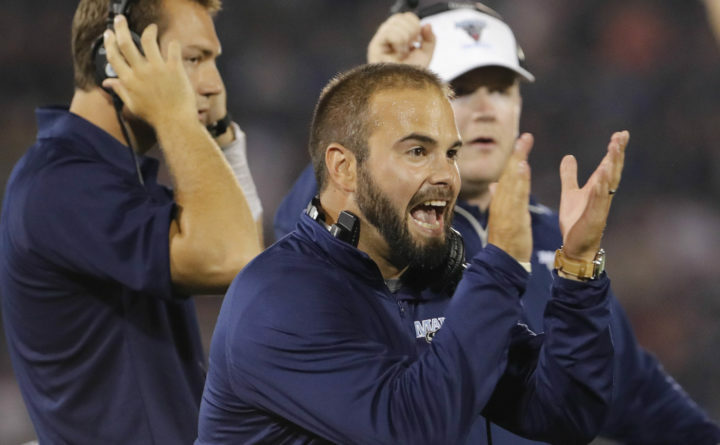 But disappointed UMaine second-year head coach Joe Harasymiak said having a Saturday game at Fenway Park in Boston against Football Bowl Subdivision opponent Massachusetts will help take the sting out of the loss. “It is probably the best game to have lined up after losing on Saturday,” said Harasymiak during Monday’s Colonial Athletic Association teleconference. “Realizing that the playoffs are gone, getting to play an FBS opponent at Fenway Park is a great opportunity for us and our program. “UMaine and UMass have had a long rivalry. They used to be in the same conference. And we have already played them since they moved to the FBS,” Harasymiak said. UMaine upset UMass 24-14 at Gillette Stadium in Foxborough, Massachusetts, in 2013. “Our kids will be excited. It’s a chance to make history and create a memory they will have forever,” he said. The Minutemen (2-7) are an FBS independent. All of their losses have been by 11 points or less, including Saturday’s 34-23 setback at Mississippi State, which this week is ranked No. 18 in the country. UMaine (4-4, 3-4 CAA) took a 10-0 lead against Delaware before the Blue Hens scored 17 unanswered points. UMaine tied it in the third quarter, but UMaine’s Micah Wright fumbled a punt that was returned for a touchdown with 13:22 left. Delaware added an insurance TD with 4:07 remaining. Harasymiak said his team never recovered from the fumbled punt-touchdown. “And we gave up too many big plays to overcome. Give them credit. They made plays when they needed to,” said Harasymiak. UMaine racked up 451 yards of total offense but managed just seven points over the game’s final 45:46. “We moved the ball pretty well against a real good defense but our guys are struggling to make plays at opportune times,” said Harasymiak. “We’re in the right position to make plays. It’s just not happening right now. The defense also had its share of struggles and was victimized by big plays. Even though quarterbacks J.P. Caruso and Joe Walker completed just 7 of 18 passes, they threw for 162 yards (an average of 23.1 yards per completion). Walker also caught a 56-yard pass from Caruso. Walker’s only completion was a 42-yarder to Brandon Whaley. Running back Kani Kane had a 28-yard run among his 26 carries for 99 yards. “We didn’t play the way we had been playing on defense. Give credit to them. They had a good scheme,” said Harasymiak. Special teams also were problematic. In addition to Wright’s fumble, the Black Bears also had a punt and a field goal blocked. Two of the bright spots were sophomore running back Josh Mack and redshirt freshman linebacker linebacker Deshawn Stevens. Mack, the conference’s leading rusher, gained 173 yards on 23 carries including a 39-yard run. He now has 1,152 yards on 191 attempts. He is averaging 144 yards per game and six yards per carry. He has scored six touchdowns. Stevens was making his first career start and registered a team-high 14 tackles. Harasymiak said the Portland experience was a positive one. A crowd of 7,212 turned out to see UMaine’s first football game in Portland since 2005. “I certainly want to thank everyone involved for making it as good as it was,” said Harasymiak. “We have a lot of alumni there and they saw a real good game. Hopefully, they come back for a game in Orono,” he added. After the UMass game, the Black Bears will conclude their season with a Nov. 18 home game against CAA playoff contender Stony Brook. “Knowing the playoffs are out is hard to swallow. We talked about it with the players on Sunday. But we’ll be ready to play. We’ve got to push forward. Our true identity will be shown in how we recover,” said Harasymiak.